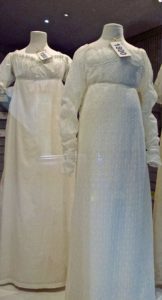 The Fashion Museum, in the basement of the Assembly Rooms, features displays of several centuries of clothing, including the early 1800s, when Jane Austen lived in Bath. Amy Laughinghouse, August 9, 2017. No Comments on Fashion Museum 1800s_7889.